When I opened up the package and saw the pink box, I thought it was so cute. 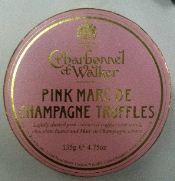 I’m a sucker for beautiful packaging and the Charbonnel et Walker Pink Marc de Champagne truffles certainly come in a cute box. The pink box with its gold lettering was sealed with two gold stickers so I knew the treasures inside had not been scoffed by anyone else. The first scent that reaches you when you open the box is boozy. The smell of what must be the champagne rises up to greet your nose and promise alcoholic treats within. Each of the truffles as you look down at them invites you to enjoy them slowly. 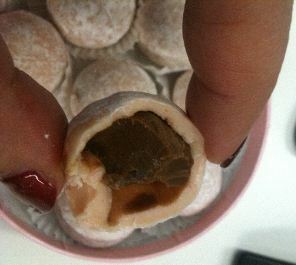 Their white chocolate exterior is coloured pink and dusted with powdered sugar. I can sort of imagine the luxurious surroundings these chocolates were once enjoyed in. I can imagine a romantic period drama, the drawing room… Ladies in their posh frocks sitting around drinking champagne or tea delicately from the most elegant china or crystal. The chocolates themselves, having arrived from a chocolate shop with a royal warrant, placed on a sterling silver tray and offered to the guests. These guests would see the beautiful white chocolate exterior and, biting in to one, the darker chocolate ganache within. It might really tickle their fancy to see that kind of contract and would be just the kind of thing Victorian England would find delightful. Fast forward to today and chocolate is no longer a luxury enjoyed by only the posh for special occasions (or the traders dealing in stocks and shares). It is common and available everywhere. The Charbonnel et Walker name endures and while their chocolates are no longer dried on the rooftops of London they are still located in the heart of London. 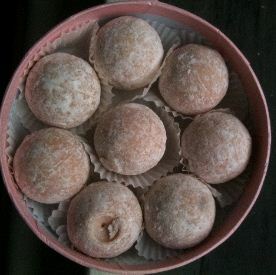 These rather large pink champagne truffles are actually kind of sweetly nice. They are not Paul A Young or William Curley or Paul Wayne Gregory but those gentlemen are pursuing a different quality in their art. These chocolates, while offering the perception of being posh, are more accessible to the mass market. I can understand why these are a best-seller these days. They are strongly scented and we taste with our nose. They are not challenging and they are sweet. This means they have a mass-market appeal a black sesame chocolate might not have. Champagne is still seen as a luxury and while they may not have real Dom Perignon in them like the offerings from Demarquette (who should send me some 😉 for review of course) they still have that luxury association and that sells. OMG, I LOVE those pink champagne chocolates! I love them so much they inspired one of my all time favourite cupcakes that I made last year ( http://www.madewithpink.com/2010/06/pink-champagne-cupcakes-iron-cupcake.html ). Personally, I quite like the Charbonnel chocolates that I’ve tried. I know some blogs give them a bad wrap, but I’ve never found a problem with them. Plus the Pink Marc de Champagne ones are soo pretty! I had similar thoughts to you- the level of marc was very satisfying- have you tried the violet creams too? I have tried them. I got one of the boxes of chocolates that recreated the special opera selection boxes of the 1950’s. Very special, very posh and rather yummy.